University of South Carolina Press, 9781611175257, 72pp. 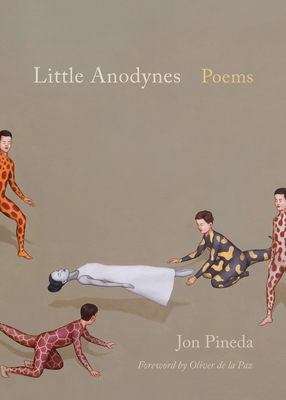 The third collection by the prize-winning Asian American poet Jon Pineda, Little Anodynes is a sequence of lyrical, personal narratives that continue Pineda's exploration of his biracial identity, the haunting loss of his sister, and the joys--and fears--of fatherhood. With its title inspired by Emily Dickinson, Little Anodynes offers its poems as "respites," as breaks in the reader's life that serve as opportunities for discovery and healing. Pineda deftly uses shortened lines and natural pauses to create momentum, which allows the poems to play out in a manner evocative of fine cinema, as if someone had left a projector running and these narratives were flickering and blending endlessly in an experience shared by the viewer, the storyteller, and the story itself.